It's hard to keep track of all your little one's super powers. First, there's the sonic hearing. It doesn't matter where they are in the house, they can always hear the sound of the freezer opening and they always assume you're getting ice cream out, to be fair, you often are. Then there's the amazing ability to instantly disappear at bathtime, that water starts rushing and all the sudden your little one is nowhere to be seen. It would be concerning if it didn't happen every night. Their most effective power? Their ability to charm. Sure, you told them not to walk with their juice about seventy-seven times in one day and when you see that spilled trail of sticky purple liquid you definitely feel mad but once you look at their big eyes your heart instantly softens. You might still be tough on the little gremlin but your heart simply isn't in it! 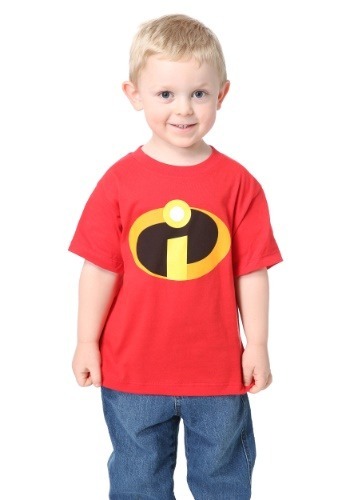 Now, your little one can embrace all of those superhero capabilities. In this red shirt with it's bold golden "i" icon your super kid will discover all sorts of new powers. Who knows, maybe they'll even learn to clean up after themselves!